Happily reading the Guardian today when I came across this article written by chef Luke Mackay. He had witnessed a number of top chefs bullying an innocent food blogger on Twitter, simply because he had had the audacity to give a three star review to one of them. So yeah, I’m not sure exactly when it became a crime to write an honest food review, but honestly – this guy & his obnoxious friends certainly haven’t earned my respect. And while we’re on the subject of respect… I always thought the chef was supposed to gain the customer’s respect, not the other way round. Surely a chef should be aware that if he serves up bad food, he will get bad reviews, which may in turn deter other customers. Chefs should take criticism and learn from it instead of behaving like spoilt brats and deterring even more customers than James’ original review would have done in the first place. They may say down with bloggers, but I say down with chefs who aren’t willing to take criticism. And as for the argument that James should have been honest and said to the chef’s face that he wasn’t entirely happy with his meal… well, who does that?! Us Brits are famous for moaning about food, but as soon as the waiter comes over and asks if everything’s okay with our meals, we smile and say, “Fine, thank you!”. 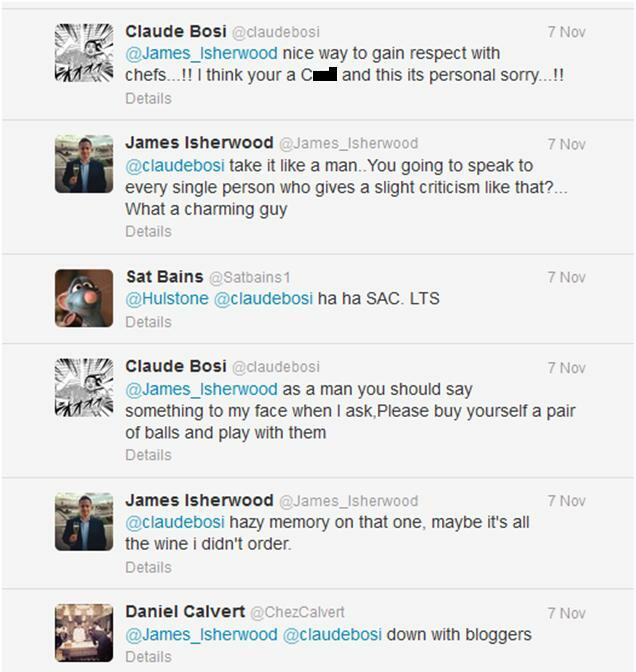 Who wants to cause a scene (which I believe it inevitably would have been with someone like Claude Bosi)? 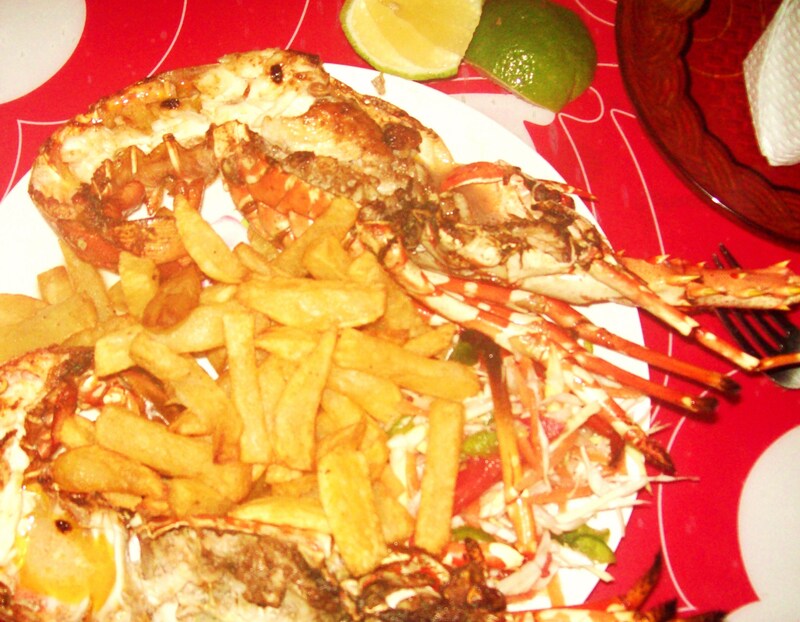 Good food gets good reviews. Bad food gets bad ones. Simple as. #Chefsunite? Who cares. I think you’ll find there’s more of us foodies and food bloggers (a.k.a. 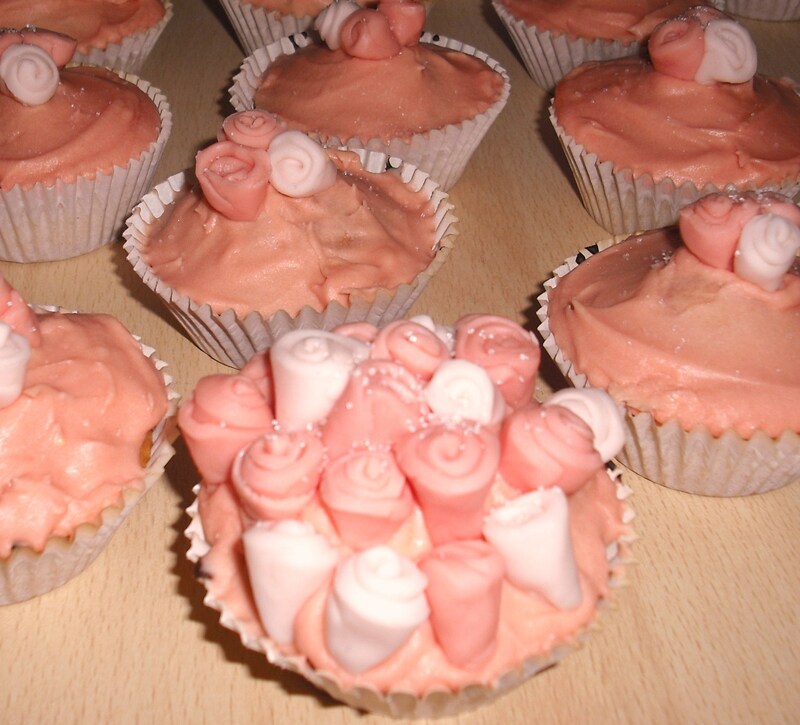 your potential paying CUSTOMERS)… #Foodbloggersunite more like it. 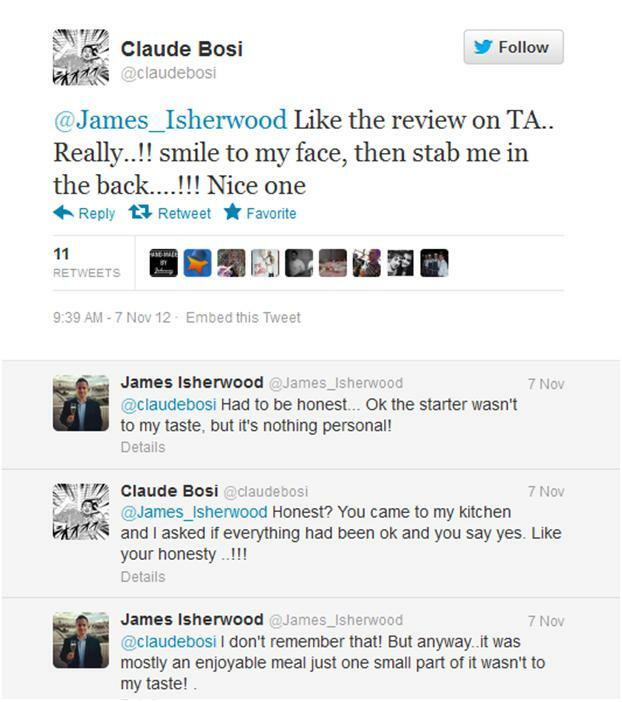 What a shame that Mr. Bosi has not learned basic civility or good manners. I wonder if he thinks this response will really get him more customers? The better thing for him to have done would have been to invite Mr. Isherwood back to his restaurant to taste some other creation or to take the original one and tweak it a little and offer him a free sample. That would have left a lasting impression on Mr. Isherwood and he would have sent more word-of-mouth business to the restaurant where he is a chef than Mr. Bosi could have ever imagined. Wow, I’m stunned that someone in a service industry position like this would treat paying customers in such a shocking, uncivil way. Boorish, crude language and berating customers is a sure-fired way of reducing business volume! He will lose business over this incident. When I have had people tell me they didn’t care for something I made, I usually just take a deep breath and try to improve the recipe for the next time or chalk it up to different tastes if I know the recipe is a good one, as is. Regardless, I move on and don’t let it get to me! Maybe Mr. Bosi should consider doing the same in the future. I completely agree with you – there were so many better ways for him to handle the situation & all he’s managed to do is to make himself look bad. The great french chef Bernard Loiseau actually killed himself because of a rumor that he was going to lose a Michelin star, a false rumor. It does not justify the behavior of the chef you mentioned, but this is how the business works. Many chefs do see their reputations as life and death. It is true that it is a high pressure industry & I do understand that. I know that reviews can have a lot of influence on chefs’ careers, but I think that if Bosi had handled the situation with more dignity he could have improved his reputation – instead of trampling all over it, as he ended up doing. I absolutely loved reading it! It was fun! The FRENCH guy is telling the OTHER guy to buy a pair of balls? Now I’ve heard everything. I don’t really use Twitter either so I’m not sure… but yes, he could well have been drunk, would explain a lot (including the terrible grammar). And as for Donald Trump… I have a feeling that may just be the way he is anyway?! Thanks for stopping by my blog. I’m enjoying roaming around yours & have to laugh at this one. I don’t watch tv so I’ve only heard about the crazy chefs who scream & throw things at people but it makes me wonder if they all think they have to live up to that image. Makes me think they’re all just playing a game. I prefer the food bloggers here who just make good food, tell a great story, & ooops sometimes have a kitchen disaster without all the dramatics. I’ll take home chefs anytime!! Thank you for stopping by my blog and the “Like” of my post. Me too & no problem 🙂 Looking forward to following your blog! Well thank you for the follow too 😀 Hope you have a lovely Christmas!! Great read – and don’t worry about ranting. I felt the same way. I don’t have anything against someone who trained for years to become a chef, but there was no need for the chef to react that way. Loved this post and thanks for reading mine. Looking forward to spending more time reading more from you! Oh wow – thank you 🙂 Hope you have a fab day too! OK… far more likely to avoid his restaurant because of him being an arrogant idiot than from one review not being up to scratch… What a big baby! My thoughts exactly! I always think that people who leave reviews tend to be the ones who didn’t like something… and they are quite often the fussy people who are never happy anyway. So I always take reviews with a pinch of salt. The way the chef behaved puts me off much, much more. I enjoyed reading this and all the comments to your post. I used to own a restaurant in the Florida Keys. I was despised by the other ‘Chef’s’ in the area because I took pride in calling myself a ‘Cook’! I first started my ‘cooking’ career at Stouffer’s in Cleveland, Ohio when I was in college. In my cooking blog, I throw in all kinds of tips on cooking, I try also to keep the humor high so it doesn’t get too class roomy or boring. The truth be told, the real reason a customer might have a better time accurately tasting food is this. A chef’s taste budds become immune to the flavor of salt. It’s like a drug. The more you use it the more you need use to still be able to taste it. A chef or cook, must taste his food many times throughout the day to make sure it is consistent to what he perceives as good tasting..The problem is he is also deluging his taste budds over and over like the drug addict to his drugs. Wow…I thought this was an interesting post so I had to share! You’re welcome! I just hope I never encounter that! LOL. Merry Christmas to you too! This entry was posted on November 8, 2012 by mixitupandmakeitnice in Food, Restaurant reviews, Sour grapes and tagged Bad reviews, Bloggers, Bullying, Chefs, Claude Bosi, Food blog, James Isherwood, Luke Mackay, Restaurant reviews, Restaurants, Twitter.